the info desk at T.U.K . 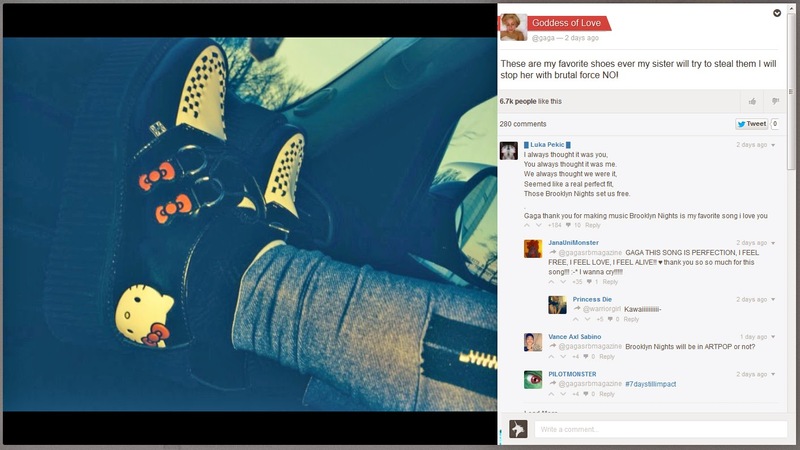 The artsy pop star posted her love for the shoes this weekend on her Twitter and her Little Monsters network. “My Hello Kitty creepers. These are my favourite shoes ever my sister will try to steal them I will stop her with brutal force NO!”, Lady Gaga posted on LM this past Saturday. Her Mondo Creepers are from the super limited edition T.U.K. x Hello Kitty shoe collaboration. These classic black and white leather rounded toe creepers feature Hello Kitty face, contrasting woven interlace detailing, and glossy satin (or cord) laces thru d-rings with red bow accents. "These are my favourite shoes ever." Also check out our newly released preview video of the Winter '14 Creeper Collections.